AirFlow Breeze register booster fan owners have raved about how the fan can make rooms that are either too hot or too cold more comfortable and livable ~ without having to adjust the thermostat and generate larger utility bills. We made the AirFlow Breeze available to fit a wide variety of wall, floor and ceiling vents. But for those homeowners with baseboard registers, there were no options on the market anywhere. 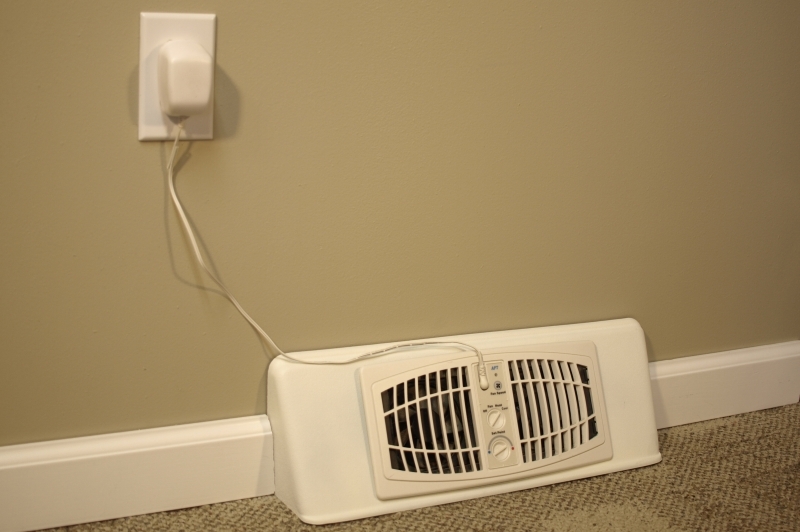 AirFlow Technology has developed the first ever BASEBOARD register booster fan. It fits the standard 18-inch baseboard register and comes in the popular almond color. In response to customer inquiry, Bernie Pierce, president of AirFlow Technology, created a prototype of a baseboard installation for the AirFlow Breeze and sent it to several of the customers who had contacted him. Made from a cardboard shipping box, Bernie wasn't sure the prototype would be a success. He was wrong! The customers were all thrilled about the unit and how it performed in his custom-made installation. The new AirFlow Breeze baseboard register booster fan is now available at aftproducts.com, starting at $69.95. We want to offer you a very special deal, for a limited time, in an exclusive offer based on your inquiry, the AirFlow Breeze baseboard booster fan will be offered to you with a $20.00 INSTANT REBATE at the aftproducts.com website. Enter NEWBBRD10 in the promo box at checkout. Offer good until November 30, 2010. Just in time to save on rising utility costs this winter, register booster fans are available to more homeowners with a variety of installation options. Tell your friends, family and neighbors. They'll be glad you did! New feature from AirFlow Technology at blog.aftproducts.com. We get so many great stories from customers who tell us how they have installed the AirFlow Breeze and what a difference it has made for them. Now you have the option of sharing your story online, too! Go to the blog and simply click on the red button. Tell about your experience with the AirFlow Breeze or AirFlow Breeze Ultra, share pictures if you like and submit. Don't forget to include a valid email address! You can WIN A CANON DIGITAL CAMERA (Canon power shot SD940 IS digital ELPH) by telling Why You Love Your AirFlow Breeze between now and November 30, 2010. The winner will be selected by a panel of judges. The winner will be notified via valid email address provided at time of entry. All submissions become the property of AirFlow Technology and may appear on our website or in other promotional material. Snap some photos and get your tale submitted. Even if you already have a digital camera, you can use this one for backup or share with someone for the holidays! Who knows, the next e-mail you receive from us could be saying, "You're the winner!" With the leaves starting to fall, sweaters are coming out and our thoughts should be turning to ways to save money and still heat the house this winter. There are several applications for the AirFlow Breeze register booster fan that can help do that. Looking at the illustration to the left, you can see that the booster fan can be used to move air from one room to another or from one level of the house to another. So if you have a fireplace, wood-burning, corn pellet or electric stove in one room, the AirFlow Breeze can pull the air warmed there into other rooms of the house. That means the temperatures throughout more of the house will be comfortable and you won't have to turn up the thermostat ~ which will save energy and money. Don't forget - it's time to change your AirFlow Breeze or AirFlow Breeze Ultra from cool to heat mode. Complete instructions are available on the Breeze product pages of our website.